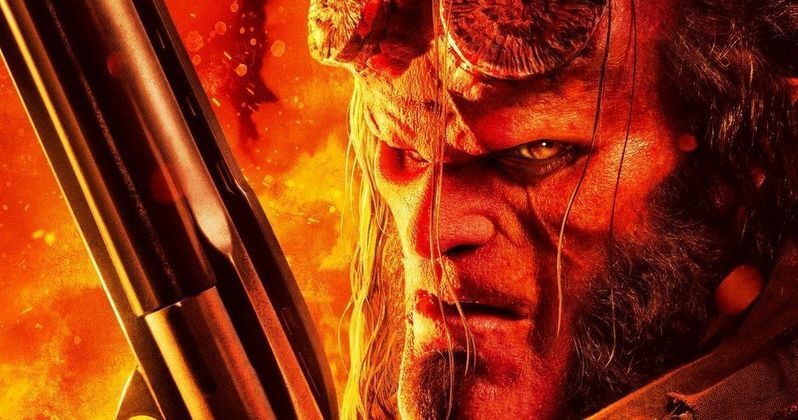 Big Red is back and getting ready for some big time violence as two new Hellboy posters have arrived online ahead of tonight's new trailer. Lionsgate has announced that the new trailer, which has heavily expected to be coming any day now, will debut online tonight at midnight E.T. To help amp that up, two posters focused on the titular character have been released, as well as a new teaser showcasing just some of the insane footage coming our way when the full trailer drops. The teaser, which clocks in at just 15 seconds, is astonishingly epic in scope. We see our hero riding on a gigantic, blood-red dragon over a sea of lava, before cutting to a few quick shots of other creatures and a snappy one-liner. The whole thing is set to an orchestral version of Smoke on the Water by Deep Purple, which really sets the tone for this new take on Mike Mignola's Dark Horse Comics series. Speaking of Mike Mignola, he's directly involved with the new R-rated reboot, which will be heading in a very different direction than the previous two Guillermo del Toro movies. He took to Twitter to reveal the first poster, which has David Harbour's new version of the character surrounded in fire, looking very grim with his gun loaded and ready to rock. The second poster also focuses on Harbour bathed in fire, this time with his horns intact, rocking his Right Hand of Doom. Mignola had this to say in his caption. "Can't wait for you all to see the new #Hellboy trailer! Tonight at midnight." Neil Marshall (The Descent) is in the director's chair for what promises to be a much more violent movie than what we had seen previously from Guillermo del Toro. For his part, del Toro had been trying to get his version of Hellboy 3 made for a long time, with Ron Perlman doing his best to drum up support. They gave it one last go before Lionsgate officially decided to go with a reboot instead. Taking a page from the Deadpool playbook, they've gone the R-rated route and it's been promised that this is going to a very violent, bloody affair. The cast includes Ian McShane, Daniel Dae Kim, Sasha Lane, Brian Gleeson, Sophie Okonedo, Penelope Mitchell, Alistair Petrie and Thomas Haden Church and Milla Jovovich as the main villain, the Blood Queen. Even though we've seen lots of monsters that are going to be a threat in the previous Hellboy remake trailer, Jovovich is the main adversary. Originally, the subtitle was going to be Rise of the Blood Queen, but that was abandoned in favor of something a bit more simple. We'll be sure to bring the new trailer your way as soon as it's made available. For now, be sure to check out the new posters, as well as the new teaser from the Lionsgate Movies YouTube channel below.